Indianapolis, Indiana (Sept. 11, 2018) – During its 59th annual meeting, held in Indianapolis, Indiana, Sept. 9 -12, 2018, the National Association of State Boating Law Administrators (NASBLA) presented its prestigious National Boating Officer of the Year award to Officer Juan Blanco with the Florida Fish & Wildlife Conservation Commission (FWC). The National Boating Officer of the Year award recognizes a law enforcement officer who has made an outstanding contribution to boating safety through enforcement and has performed an outstanding service to the agency or state in any facet of recreational boating safety. Officer Juan Blanco began doing volunteer work for the Florida Fish & Wildlife Conservation Commission in 2010 and fell in love with the agency and it’s mission. In 2015, Ofc. Blanco was hired and has taken a leadership role in Boating Under the Influence (BUI) and Driving Under the Influence (DUI) enforcement within his assigned patrol area. Ofc. Blanco participated in all of the BUI saturation details in Miami-Dade County in 2017 and personally made over 25 arrests for BUI. He also assisted with multiple BUI investigations in which he mentored many officers in adequate BUI procedures. Ofc. Blanco’s work ethic has influenced his peers to understand the importance of public service and public relations. On a daily basis Ofc. Blanco prioritizes and is a strong believer in education. He has led and participated in over a dozen “Career Days” at local schools and is frequently called upon to assist in public outreach due to his passion to educate the public and reach the next generation. Ofc. Blanco has also been part of the state’s initiative to partner Big Brothers Big Sisters. The vision behind this partnership is to encourage not only positive relationships with Law Enforcement Officers and the community but also to educate the next generations to enjoy the outdoors responsibly and understand the importance of conservation. Ofc. Blanco deployed immediately for Hurricane Harvey, Irma and Maria. After the catastrophic damage done by Irma, he was deployed to assist and kept a positive attitude and willingness to help although he had also been personally affected by hurricane Irma. Ofc. Blanco also volunteered to assist in Puerto Rico after hurricane Maria. 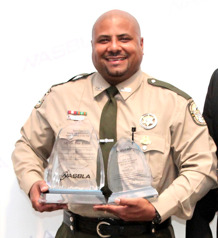 The National Association of State Boating Law Administrators congratulates Officer Juan Blanco on receiving the National Boating Officer of the Year award in recognition of his dedication, commitment and impact on recreational boating safety. The National Association of State Boating Law Administrators is a national nonprofit organization that works to develop public policy for recreational boating safety. NASBLA represents the recreational boating authorities of all 50 states and the U.S. territories. NASBLA offers a variety of resources, including training, model acts, education standards and publications. Through a national network of thousands of professional educators, law enforcement officers and volunteers, the organization affects the lives of over 76 million American boaters. To learn more about how NASBLA visit www.nasbla.org.